Welcome back to Mini Chef Mondays! I’ve been taking a little break from posting while I was traveling and visiting family but now we’re back and we made sure to keep up with our Mini Chef while we were out of town! 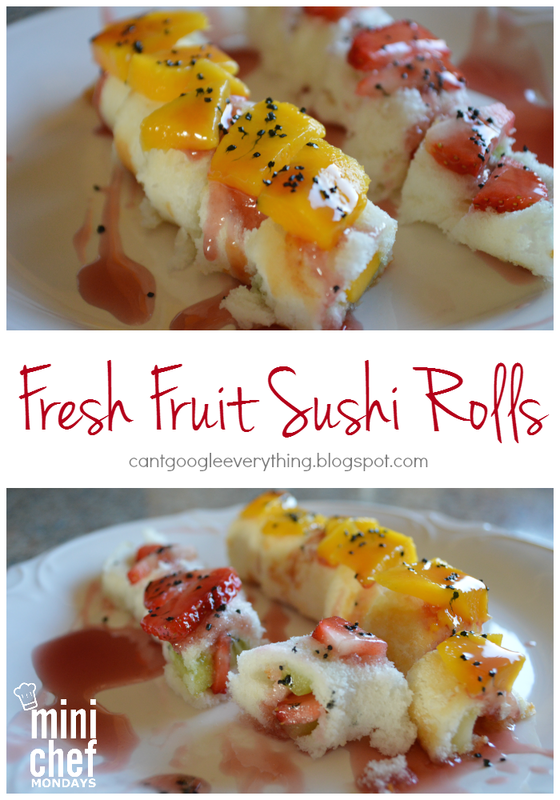 This week we whipped up a super yummy recipe to share- fresh fruit sushi! 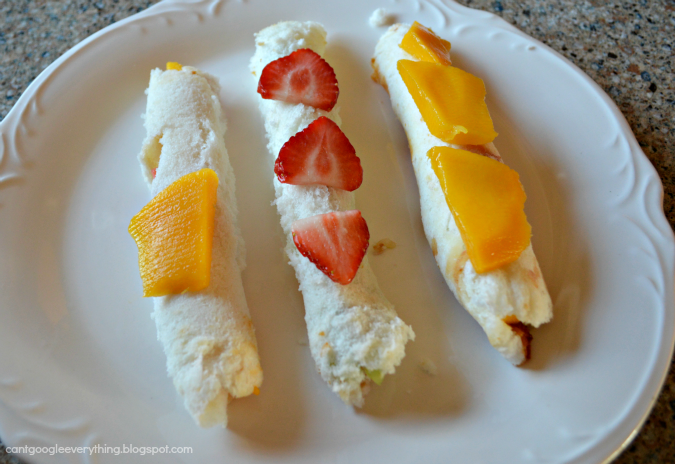 I’ve seen fruit sushi recipes using everything from rice krispies cereal to real rice to fruit roll ups, but I took a different approach and it turned out really delicious! I hope you love it, too! 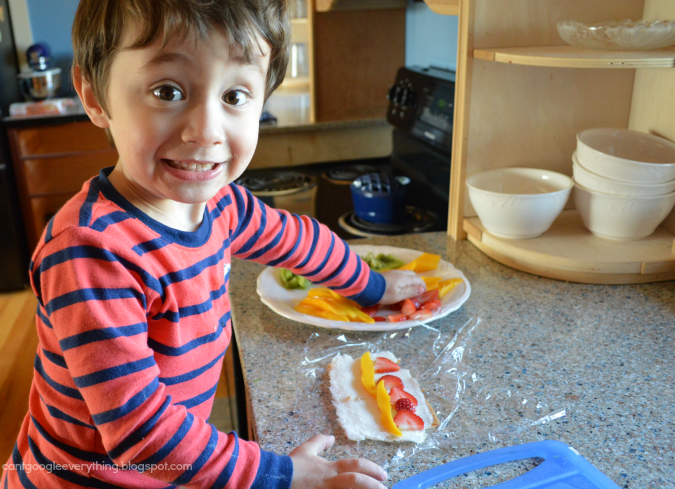 Read to on to find out how to make Carter and I made our fruit sushi! Fresh fruit! We used strawberries, mango and kiwi. Other good options would be peaches, pineapple, star fruit, blueberries and banana. Really any fruit you like in various combinations would work. 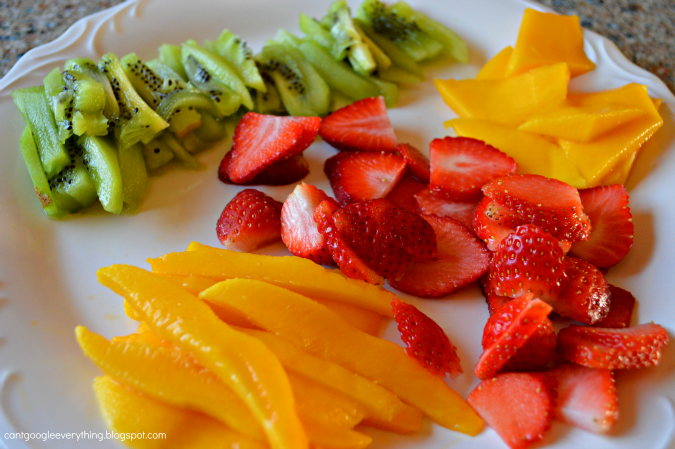 First, cut up your fruit into long thin pieces. For the kiwi I sliced them into matchsticks. The mango I cut into long slices for the insides and long, but wide slices for the top of the sushi. I sliced the strawberries and then we learned we needed to also cut each slice in half to make the sushi easier to roll. If your kid is old enough to use a knife you can let them help you with this step! Next, slice the angel food cake into thick slices. I started off to thin and they crumbled apart when we rolled them! So your slices should be about a good 1/2 inch thick for best results. 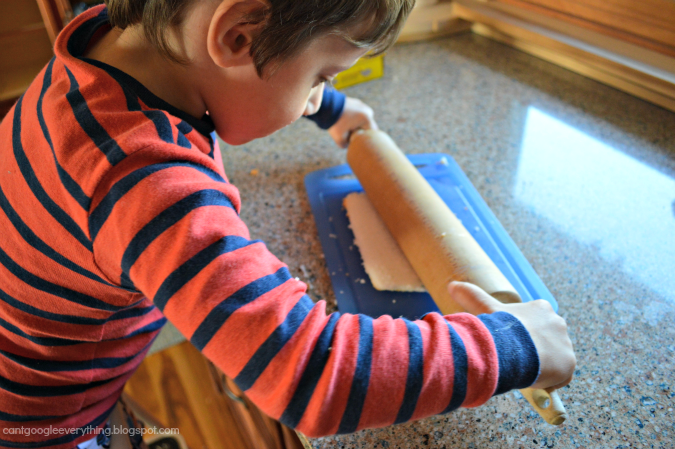 Then, use a rolling pin to compress the cake. We added a little flour so it wouldn’t stick to the rolling pin. Transfer your cake to the plastic wrap or sushi mat. Add the fruit in one line across the cake. Carefully roll the sushi up and press firmly to keep it together! Carefully transfer to a plate and add fruit across the top to decorate. Slices the rolls and then drizzle with the sauce and sprinkle black sprinkles on to look like sesame seeds! 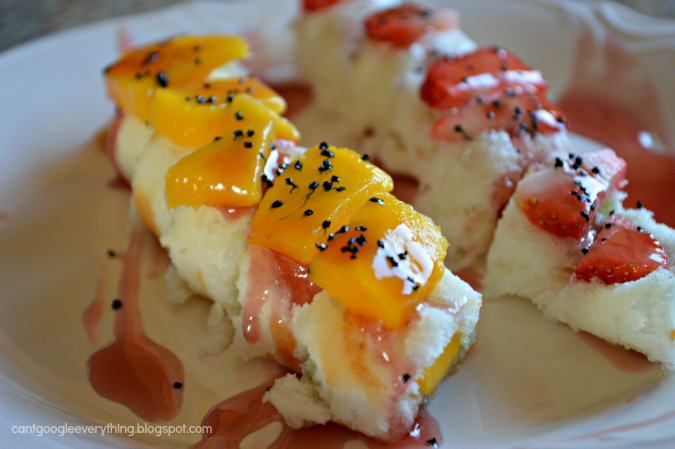 The sushi is pretty sweet so if you don’t want it too sweet you can omit the sauce here! Serve and enjoy! Perfect for a dessert, yummy snack or super special breakfast! Those turned out really pretty! I wouldn't have thought to use the angel food cake, what a great idea. What a great idea! These turned out super cute! These look so tasty and fun to make! I love real sushi but my three year old, not so much. He would love to make these! Delicious AND healthy, plus we love sushi, so we should definitely be trying this one day! It’s so yummy!! Not sure they sell this kind of cake pre made in Switzerland (I made this recipe in the US) but I’m sure we could find an appropriate substitute! There are “Tortenboden” that can be bought. They would serve the purpose.